This piece was first published two years ago on 4/20. Warren Haynes, the Allman Brothers Band guitarist, routinely plays with the surviving members of the Grateful Dead, now touring as The Dead. He's just finished a Dead show in Washington, D.C. and gets a pop quiz from the Huffington Post. He pauses and thinks, hands on his side. "I don't know the real origin. I know myths and rumors," he says. "I'm really confused about the first time I heard it. It was like a police code for smoking in progress or something. What's the real story?" Depending on who you ask, or their state of inebriation, there are as many varieties of answers as strains of medical bud in California. It's the number of active chemicals in marijuana. It's teatime in Holland. It has something to do with Hitler's birthday. It's those numbers in that Bob Dylan song multiplied. It was Christmas week in Oakland, 1990. Steven Bloom was wandering through The Lot - that timeless gathering of hippies that springs up in the parking lot before every Grateful Dead concert - when a Deadhead handed him a yellow flyer. "We are going to meet at 4:20 on 4/20 for 420-ing in Marin County at the Bolinas Ridge sunset spot on Mt. Tamalpais," reads the message, which Bloom dug up and forwarded to the Huffington Post. Bloom, then a reporter for High Times magazine and now the publisher of CelebStoner.com and co-author of Pot Culture, had never heard of "420-ing" before. 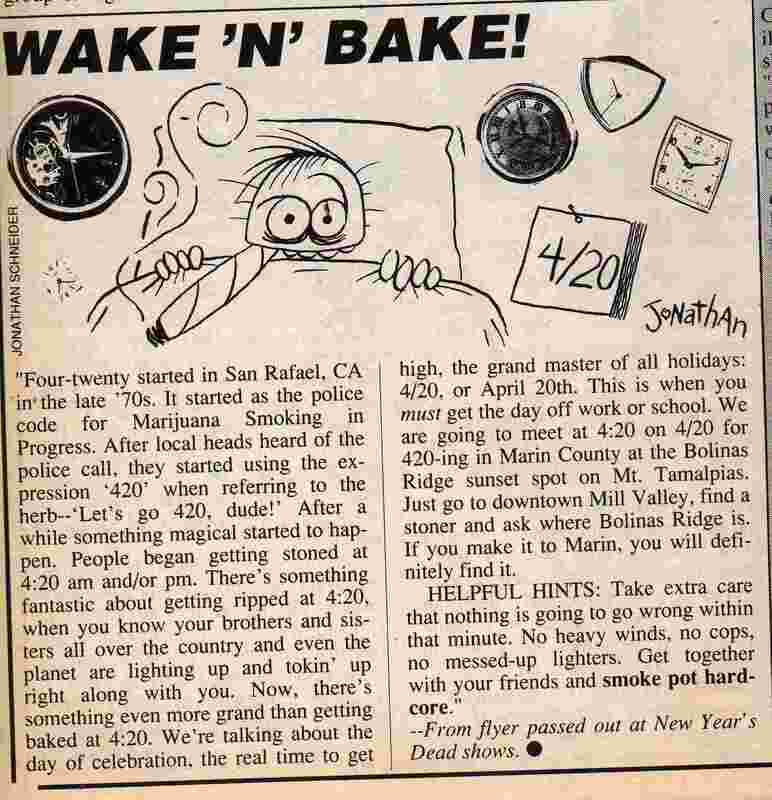 The flyer came complete with a 420 back story: "420 started somewhere in San Rafael, California in the late '70s. It started as the police code for Marijuana Smoking in Progress. After local heads heard of the police call, they started using the expression 420 when referring to herb - Let's Go 420, dude!" The Waldos never envisioned that pot smokers the world over would celebrate each April 20th as a result of their foray into the Point Reyes forest. The day has managed to become something of a national holiday in the face of official condemnation. This year's celebration will be no different. Officials at the University of Colorado at Boulder and University of California, Santa Cruz, which boast two of the biggest smoke outs, are pushing back. "As another April 20 approaches, we are faced with concerns from students, parents, alumni, Regents, and community members about a repeat of last year's 4/20 'event,'" wrote Boulder's chancellor in a letter to students. "On April 20, 2009, we hope that you will choose not to participate in unlawful activity that debases the reputation of your University and degree, and will encourage your fellow Buffs to act with pride and remember who they really are." The code pops up in Craig's List postings when fellow smokers search for "420 friendly" roommates. "It's just a vaguer way of saying it and it kind of makes it kind of cool," says Bloom. "Like, you know you're in the know, but that does show you how it's in the mainstream." The Waldos do have proof, however, that they used the term in the early '70s in the form of an old 420 flag and numerous letters with 420 references and early '70s post marks. They also have a story. "We would remind each other in the hallways we were supposed to meet up at 4:20. It originally started out 4:20-Louis and we eventually dropped the Louis," Waldo Steve tells the Huffington Post. The first forays out were unsuccessful, but the group kept looking for the hidden crop. "We'd meet at 4:20 and get in my old '66 Chevy Impala and, of course, we'd smoke instantly and smoke all the way out to Pt. Reyes and smoke the entire time we were out there. We did it week after week," says Steve. "We never actually found the patch." But they did find a useful codeword. "I could say to one of my friends, I'd go, 420, and it was telepathic. He would know if I was saying, 'Hey, do you wanna go smoke some?' Or, 'Do you have any?' Or, 'Are you stoned right now?' It was kind of telepathic just from the way you said it," Steve says. "Our teachers didn't know what we were talking about. Our parents didn't know what we were talking about." It's one thing to identify the origin of the term. Indeed, Wikipedia and Urban Dictionary already include references to the Waldos. The bigger question: How did 420 spread from a circle of California stoners across the globe? As fortune would have it, the collapse of San Francisco's hippie utopia in the late '60s set the stage. As speed freaks, thugs and con artists took over The Haight, the Grateful Dead picked up and moved to the Marin County hills - just blocks from San Rafael High School. "Marin Country was kind of ground zero for the counter culture," says Steve. The Waldos had more than just a geographic connection to the Dead. Mark Waldo's father took care of real estate for the Dead. And Waldo Dave's older brother, Patrick, managed a Dead sideband and was good friends with bassist Phil Lesh. Patrick tells the Huffington Post that he smoked with Lesh on numerous occasions. He couldn't recall if he used the term 420 around him, but guessed that he must have. The Dead, recalls Waldo Steve, "had this rehearsal hall on Front Street, San Rafael, California, and they used to practice there. So we used to go hang out and listen to them play music and get high while they're practicing for gigs. But I think it's possible my brother Patrick might have spread it through Phil Lesh. And me, too, because I was hanging out with Lesh and his band when they were doing a summer tour my brother was managing." The Waldos also had open access to Dead parties and rehearsals. "We'd go with [Mark's] dad, who was a hip dad from the '60s," says Steve. "There was a place called Winterland and we'd always be backstage running around or onstage and, of course, we're using those phrases. When somebody passes a joint or something, 'Hey, 420.' So it started spreading through that community." Lesh, walking off the stage after a recent Dead concert, confirmed that Patrick is a friend and said he "wouldn't be surprised" if the Waldos had coined 420. He wasn't sure, he said, when the first time he heard it was. "I do not remember. I'm very sorry. I wish I could help," he said. Wavy-Gravy is a hippie icon with his own ice cream flavor and has been hanging out with the Dead for decades. HuffPost spotted him outside the concert. Asked about the origin of 420, he suggested it began "somewhere in the foggy mists of time. What time is it now? I say to you: eternity now." As the Grateful Dead toured the globe through the '70s and '80s, playing hundreds of shows a year - the term spread though the Dead underground. Once High Times got hip to it, the magazine helped take it global. "I started incorporating it into everything we were doing," High Times editor Steve Hager told the Huffington Post. "I started doing all these big events - the World Hemp Expo Extravaganza and the Cannabis Cup - and we built everything around 420. The publicity that High Times gave it is what made it an international thing. Until then, it was relatively confined to the Grateful Dead subculture. But we blew it out into an international phenomenon." Sometime in the early '90s, High Times wisely purchased the web domain 420.com. Bloom, the reporter who first stumbled on it, gives High Times less credit. "We posted that flyer and then we started to see little references to it. It wasn't really much of High Times doing," he says. "We weren't really pushing it that hard, just kind of referencing the phrase." The Waldos say that within a few years the term had spread throughout San Rafael and was cropping up elsewhere in the state. By the early '90s, it had penetrated deep enough that Dave and Steve started hearing people use it in unexpected places - Ohio, Florida, Canada - and spotted it painted on signs and etched into park benches. "They said, 'The fact is, there is no 420 [police] code in California. You guys ever look it up?'" Blooms recalls. He had to admit that no, he had never looked it up. Hager flew out to San Rafael, met the Waldos, examined their evidence, spoke with others in town, and concluded they were telling the truth. Hager still believes them. "No one's ever been able to come up with any use of 420 that predates the 1971 usage, which they had established. So unless somebody can come up with something that predates them, then I don't think anybody's going to get credit for it other than them," he says. "We never made a dime on the thing," says Dave, half boasting, half lamenting. He does take pride in his role, though. "I still have a lot of friends who tell their friends that they know one of the guys that started the 420 thing. So it's kind of like a cult celebrity thing. Two years ago I went to the Cannabis Cup in Amsterdam. High Times magazine flew me out," says Dave. The other three Waldos have also been successful, Steve says. One is head of marketing for a Napa Valley winery. Another is in printing and graphics. A third works for a roofing and gutter company. "He's like, head of their gutter division," says Steve, who keeps in close touch with them all. "I've got to run a business. I've got to stay sharp," says Steve, explaining why he rarely smokes pot anymore. "Seems like everybody I know who smokes daily, or many times in a week, it seems like there's always something going wrong with their life, professionally, or in their relationships, or financially or something. It's a lot of fun, but it seems like if someone does it too much, there's some karmic cost to it." "I never endorsed the use of marijuana. But hey, it worked for me," says Waldo Dave. "I'm sure on my headstone it'll say: 'One of the 420 guys.'" Ryan Grim is the author of This Is Your Country On Drugs: The Secret History of Getting High in America, also available at independent bookstores.